Philanthropist and long-time San Diego resident Dan McKinney has died, The San Diego Union-Tribune reported Saturday. 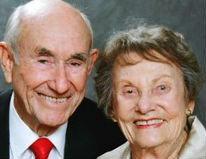 McKinney and his wife, Violet “Vi” McKinney, moved to La Jolla in 1956 and had supported numerous charities and non-profits throughout their residence, the Union-Tribune said. In the last two years, the entrepreneur has donated approximately $20 million, divided equally among the La Jolla YMCA, the San Diego Zoo, the Maritime Museum of San Diego, and the YWCA’s Becky’s House domestic abuse shelter. The McKinneys’ generosity was recognized by The Chronicle of Philanthropy when the couple was put on its “America’s Top Donors” list for 2015. Their other charities include the Humane Society, Scripps Clinic and Meals-on-Wheels. McKinney died of natural causes on Aug. 26. He was 96.